A fellow bear artist recently asked me if I would make a bear for him, and he had a previous design in mind. So with a certain trepidation because I don't really like going back to older designs, I waited while we found the appropriate picture on my website. 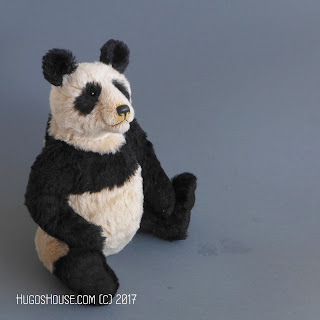 The preferred bear turned out to be a Panda, from quite a few years ago, and since I hadn't made one for a while, and the idea very much appealed to me, I happily agreed. This of course prompted me to think about making other Pandas before embarking on the requested one, which is quite large, and I wanted to make a new smaller one too, the commission bear will come in due course but I was keen to make a small one first. When ever I think of making Panda I create my own challenges. It must still look like one of my bears yet have proportions which are more Panda-like. And of course the obvious black & white pattern requires some decision about where the joins are, and, because I don't like straight line joins on them, a number of opposing curves to sew. Then there are the eye patches, I really don't like resorting to fixing them on top of the white cloth, marginally better than using a marker pen or airbrush but I feel that I must make them as a sewn in part of the of the pattern. Fiddly to say the least but I have found a helpful technique which helps but it is still only practical down to a certain size. 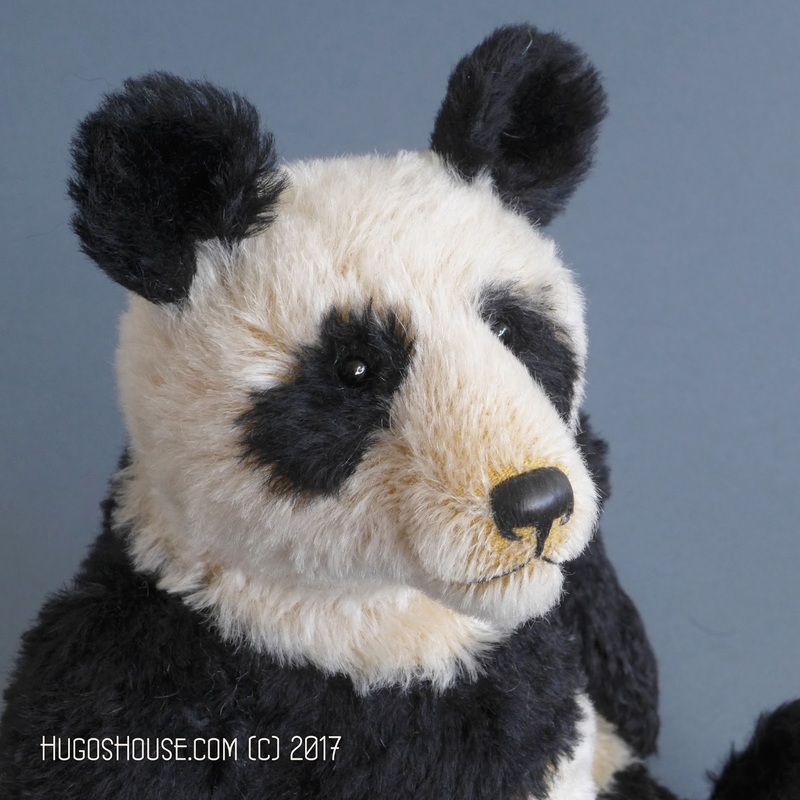 So I set out to create a Panda under 12 inches, and I have just about managed it, he is 12.5 inches to the top of his ears. I think a smaller one would have to have applied patches for his eyes ! 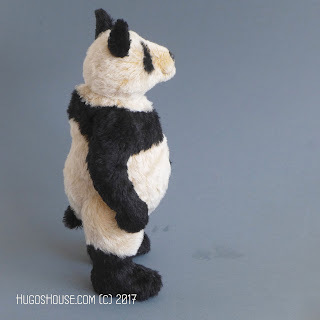 I am calling these Panda Teds, he is not supposed to be a realistic Panda, but a ted with leanings towards Panda shape and proportion. He isn't black and white either, I used black mohair alongside a pale wheat colour over a pale gold cloth, a personal preference to the plain white. Designing him, making test pieces, all the hand sewing combined with my increasingly arthritic hands took 6 days, perhaps I make too much heavy weather of things but it is the only way I know, and at least I can be confident I have done my best. 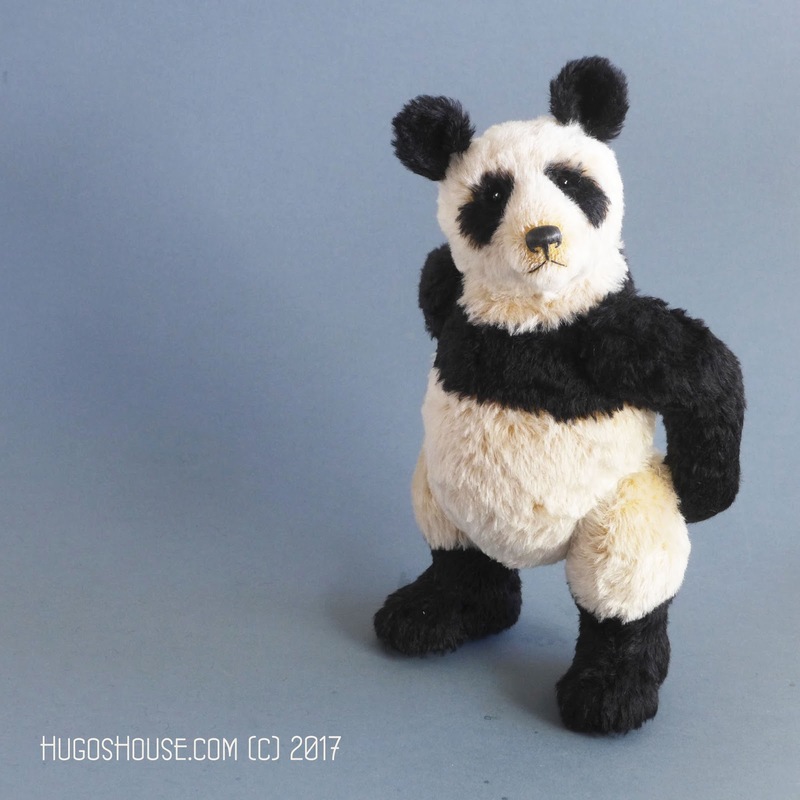 So thanks to a commission I have completed a little project which I thoroughly enjoyed, he was listed for my mailing list and I had one of the biggest, most enthusiastic responses and he was sold immediately. Lovely and very encouraging after all the worrying and fiddling designing and making him. Needless to say I will be making more of them.